resurrection | Is Christianity True? Impact 360 Institute, which runs a gap year program and a two week worldview and leadership camp called Immersion, has released a short animated video on the resurrection. This is part of an online course they are offering ($39.99) titled Explore the Resurrection. This looks really good. 9 sessions, just over 2 hours, with leading scholars such as John Lennox, William Lane Craig, Sean McDowell and Michael Licona. Fully mobile with interactive review questions. They put some real effort into this. Definitely worth a look. Questioning the Bible: 11 Major Challenges to the Bible’s Authority and Welcome to College: A Christ-Follower’s Guide for the Journey and co-authored Is God Just a Human Invention? And Seventeen Other Questions Raised by New Atheists with Sean McDowell. A detective thriller about a Roman Tribune charged with the task of finding the body of Jesus Christ in order to stop an uprising after he is declared risen from the dead. Risen is an honest and truthful portrayal of a skeptical mind approaching the evidence for the resurrection of Jesus Christ. And it is a fantastic story. It is an authentic fresh take on the Gospel from the unique perspective of an unbeliever. Great writing, unpredictable story, strong acting, truthful and honest portrayal. Riveting drama. Wow. That is high praise from Brian Godawa, who is a screenwriter and very critical of Christian movies that come out that are cheesy or not true to the bible. With a bit of hesitancy, my wife and I went to see Risen last night. All things considered, we were both pleasantly surprised! It may not be everyone’s cup of tea, but Risen is a very good film. It has excellent production values, talent on both sides of the camera, and makes the most of a somewhat unconventional approach (at least these days) to Biblical filmmaking. And best of all, it works. This tale of faith and redemption marks a new chapter for biblical epics. While not perfect, Risen still delivers one of the best portrayals of Christ’s death and resurrection to date, as we witness the events from the eyes of a pagan outsider. 4 out of 5. I think this one should be on our shortlist to see. To Read This Week: Former Atheists, Worst Objection, and Testimony. Former Atheists Speak: 44 Quotes by James Bishop at Historical Jesus Studies. Bishop spent two years or so compiling these quotes from former atheists. 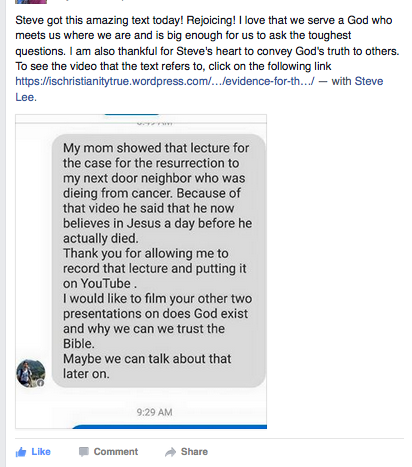 Evidence for the Resurrection Video – I got this Facebook message a couple of days ago from Clint who filmed the lecture on the resurrection that I posted a couple of weeks back. It was very encouraging. Below the FB message is the video.